Tooth loss is an extremely prevalent problem in the United States. It is estimated that 178 million Americans are missing at least one tooth while another 35 million do not have any remaining natural teeth. With each one vital for your oral health and functions, they need to be replaced. However, there are many options available. It can be difficult to determine which solution will best meet your needs. 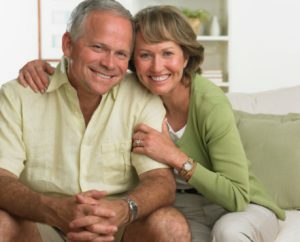 At New Image Dentistry, we will evaluate your oral health and discuss your desired results to help you find the best form of dentures in San Antonio to complete your smile. Why Do I Need to Replace Missing Teeth? Every tooth in your mouth has an important job to ensure you can eat and speak correctly. When even one is missing, your ability to talk and chew decreases. Not to mention, you will quickly develop insecurities about your smile. However, the issues are deeper than you might realize. When you lose a tooth, you can lose more in the future if you do not replace them. Your remaining natural teeth will begin to shift toward the open space, increasing your risk for tooth decay and gum disease due to poor alignment. Over time, you will lose the supporting structures, such as the roots and bone density, causing them to become loose and eventually fall out. What are My Options to Replace My Teeth? Now, new advancements in dentistry provide you with several options to treat tooth loss. Depending on how many are missing, we will help you choose the best solution to complete your smile. Partial Dentures: Partial dentures in San Antonio are used to replace one or more missing teeth in a row. Prosthetic teeth are held in a gum-colored arch which is attached to a metal framework. It is then placed on your adjacent teeth to hold it in place. In some cases, dental crowns are used so it is not removable. This is an effective and convenient form of tooth replacement but can cause damage to the crowned teeth over time. Even if your missing teeth are not text to each other, we can fill the space. Full Dentures: You can replace an entire arch of teeth using a gum-colored base that holds the prosthetic teeth. It is then held in place using a denture adhesive. Now, they look and feel more natural than ever, but they will never fully give you the same appearance or capabilities as your natural teeth. Implanted Dentures: More people are turning to implanted dentures to treat tooth loss. Dental implant posts are surgically placed into the jawbone to permanently hold the prosthetic teeth in place. When compared to other options, implant-supported dentures more closely mimic the appearance and function of natural teeth. In addition, they are the only option to stop bone loss and they will last a lifetime. Where Can I Replace My Missing Teeth? If you are ready to regain a healthy, complete smile, New Image Dentistry can help. We will evaluate your tooth loss to create a customized treatment plan to fill the empty space. Contact our office today to schedule your consultation for the perfect smile.